Ross' goose (Anser rossi) is a species of geese that lives predominantly in North-America. The geese breed in northern Canada, winters in the southern United States and occasionally even strays into northern Mexico. Because of its attractive appearance Ross’ geese are sometimes part of wildfowl collections in Europe. And yes, they do escape. 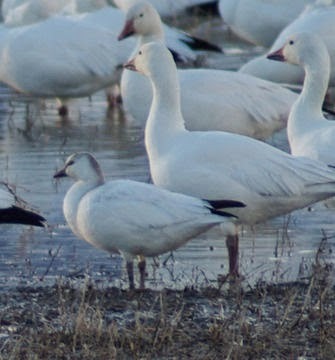 Ross’ Goose Hepatitis B Virus has been isolated from these Ross' geese. It is closely related but markedly different from Duck Hepatitis B Virus. Again, Hepatitis viruses seem to infect ever more species than previously thought. More species and more different viruses mean more potential mixing vessels for these viruses. Who knows where the next mutated version lurks. It could start infecting humans right at this very moment.